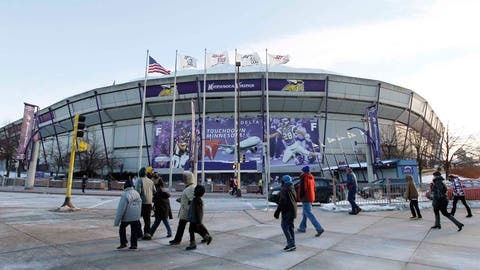 Fans walk outside the Mall of America Field at the Hubert H. Humphrey Metrodome before the Vikings' final game there before the building is torn down. 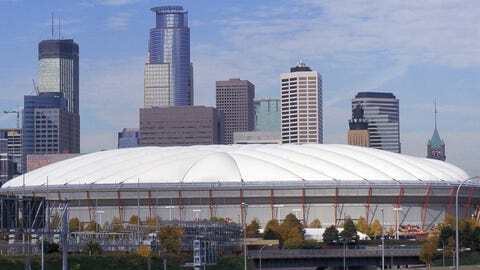 MINNEAPOLIS — It hit Lisa Lehman and her son as they drove into downtown Minneapolis on Sunday morning, that ominous, white Teflon dome slowly coming into view. Her 20-year-old, a Metrodome soda vendor, pointed out how different the Twin Cities skyline is about to look and feel. "We’re used to that," Lehman said motioning to the pale, soon-to-be-demolished stadium behind her right shoulder while she and a friend waited to enter Huberts bar and restaurant. Vikings executive producer Brian Harper experienced a similar bout with nostalgia Sunday as he came up Interstate 35W and watched the sun rise behind the massive concrete shed they named for the 38th U.S. president. Harper has been getting up at the crack of dawn for 10 years to come here and oversee every form of in-game entertainment — Led Zeppelin’s "Immigrant Song’ blasting as the team exits the tunnel, fireworks from behind and above the neon-yellow goalposts, visuals on the place’s small, grainy video boards and the blowing of the famous gjallarhorn before every game, to mention a few. He’ll be happy when the franchise moves into its new, state-of-the-art home on this same site ahead of the 2016 football season. Manifold technology issues in an aging venue make his job difficult often, downright frustrating at times. "You drive past the building, and you’re like ‘wow, this is actually happening," Harper said. "This is the last time we’re gonna have an event here.’"
A crowd of 64,134 came out to bid the Dome adieu Sunday when the Vikings hosted the Lions in the teams’ regular-season finale. As they all filed in, a mix of memory and anticipation permeated the locale’s tailgating lots, concession lines and royal blue seats, which will soon go on sale for between $64 and $85 apiece. Local restaurant manager Dave Kell has occupied one of them during almost every home game since Minnesota’s inaugural season at the Metrodome. He and his family have had season tickets since 1978, and Sunday, he gathered in nearby Lot B with relatives, in-laws in friends to tailgate in subzero temperatures. A fryer, a portable grill and a crock pot full of savory white chili were the group’s only sources of warmth as the thermometer dipped to minus-3 degrees. With the Vikings moving to the University of Minnesota’s outdoor TCF Bank Stadium while the new digs are built, they might as well start acclimating now, Kell said. "The colder it is," Kell said, "the more we’ll tailgate. Bring it on." Kell’s purple fandom dates back to the old Metropolitan Stadium days, when he was 5 years old. He vividly remembers Gary Anderson’s missed field goal in the 1998 NFC championship game and Adrian Peterson’s record-breaking day in 2007. His brother-in-law, Al Kcheraz, has been along for a lot of those outings. The pair will miss the Dome, they said, but not the outdated amenities and men’s room trips that take an entire half, according to Kell. "We have a lot of history (here)," said Kcheraz, 41 (a year older than Kell), "and we wouldn’t miss this last game at the Dome for nothing. "Progress is good. We’re looking forward to the future." After a few suds and several portions of food, the family and their dozens of fellow weather-defying tailgaters meandered toward the Metrodome. More than an hour before game time, its concourses were packed to the brim with folks preparing for one more memory-making day there. "This is why they’re building a new one." "If you need to make a pit stop, I’d hit it now." "They’re tearing this thing down for a reason." The quips came between "excuse mes" and elbows as patrons shuffled sluggishly toward their seats. Increased traffic flow is just one of the many improvements the Vikings’ new, glass-encased palace is promised to feature. It’ll be bigger, bolder and contain a higher overall square footage (1,750,000 to the Dome’s 900,000), more restroom fixtures (979 to 435) wider concourses (32-50 feet compared to 24) and larger video boards (12,560 square feet compared to 646), among other selling points. That last one has Harper excited. "We’re strapped in a lot of ways," he said. But replicating the atmosphere — particularly the earsplitting crowd and music volume — will be a chore. "Our fans are knowledgeable," Harper said. "They know when to do things and when to cheer. That’s gonna be hard to recreate. We’ve got our work cut out for us on that one." Longtime team statistician Dan Endy will miss the old, place, too. He’s helped churn out box scores since 1969 and can count on his fingers the home games he’s missed during that span. He’s quick to point out the Dome cost $55 million to build. Its replacement, which is already under construction: $975 million. "They set out to build a cheap stadium," Endy said. "They succeeded. But it’s been a very functional, a utilitarian edifice." Gary Nahnsen may have briefly disagreed as he and his 12-year-old son Alex Nahnsen squirmed their way through the upper-deck concourse to their spot in Section 225 Sunday. The pair traveled up from Des Moines, Iowa to take in their first Dome experience together. As they sat halfway between the fading structure’s roof and the top of the lower bowl and munched on personal pizzas, Alex’ eyes widened. "It’s pretty cool," he said. "It’s big." Soon after, the flashbulbs started going off — thousands of Minnesotans and Midwesterners capturing one last image of a place known for both triumph and collapse (both figurative and literal). Former Vikings running back Robert Smith addressed the crowd at halftime, citing Dr. Seuss’ famous quote "don’t cry because it’s over; smile because it happened." During the third quarter, fans began the wave, minus the tossing of paper shreds that usually accompanies the stadium-wide ritual. Sometime before the spectacle, Alex Nahnsen turned to his dad. "Can we come back in a couple years when they build the new one?" he asked.